‘Killing Daniel’ by Sarah Dobbs. via ‘Killing Daniel’ by Sarah Dobbs. Killing Daniel launch #1 – Photos and Fun. Full stop. I’m a fan of photos. I have that thing of my mothers that made her hoard plastic bags at the bottom of every wardrobe door. Stuffed with photos. Photos at the beach with ice cream and pigtails and my cousins and brother. Present piles at Xmas, through the years, cats. Dogs. Relatives. It’s a good flipping job things are digital these days, because I live in a tiny flat and I’ve got millions of the suckers. Here’s a selection from the Norwich launch of Unthology 3 and Killing Daniel. I surprised myself by not being falling-over twitchy nervous and being able to listen to the other wonderful readers – Sandra Jensen, who is just cool, right?, CD Rose (funny man destined for Russia a few hours after his reading! ), Sharon Zink in her kitten shoes and The Ashley Stokes who is possibly a magician as he can do everything. I’ll save the nerves for the Manchester launch. Nothing like having to swear in front of your parents eh? Please come if you can, it’s destined to be a fun night. We’ll be drinking, reading and hopefully running out of books on 13 December, King’s Arms, Salford. Kicking off at 7.30pm. There’s an event page here if you want to sign up! It was fun. Full stop. Guest Post by the talented writer Sarah Dobbs. via Guest Post by the talented writer Sarah Dobbs. Given that it’s been such a long process, ‘out now’ feels like it’s been A Long Time Coming. But yes, Killing Daniel is, in fact, OUT NOW. Good luck! And thanks to everyone who has shared and supported us so far! Thanks to everyone who entered the @KillingDaniel competition. We had about 50 entries, excluding my mum. The winner was… dun dun DUN @great_tea. The publishers have very kindly said that everyone who did enter is allowed the book at 23% off. I know this because I asked my brother how to calculate the figures and he’s a genius. Anyway, that’s good. Killing Daniel for a tenner, plus free postage. Simply email information@unthankbooks.com with your order and mention that you entered the competition… I’ll back you up! So, Killing Daniel is out on Monday. Bang! Fireworks and all that. The build-up is starting to get quite exciting with fortune cookies afoot at the Norwich launch which takes place on 9 November to kick off the Unlit Festival! I’m escaping the country tonight for a weekend in Oslo. The excitement is all too much! No, it was booked ahead. The day I get back the book will be properly pre-orderable. Although I know people who pre-ordered theirs ages ago have them already! I’ve actually signed one. That’s a weird feeling. As are the reviews. I thought it would be difficult to take, but there aren’t any (yet) they make me want to curl up, strain out my writerly ambitions, and become a police woman. Or something like that. You know, something sensible. What it has made me do, and reaffirmed, is a drive to keep changing and improving. Writing evolves as you do, I reckon and any critiques fuel this desire in me. We had a visiting writer at Edge Hill recently, Joe Stretch (very funny) and he said that all novels are imperfect. I picked up on this perhaps because I hope it’s true but it also makes sense. There are many novels I’ve loved – Troll, Johanna Sinisalo, Electricity, Ray Robinson, Sleep with Me, Joanna Briscoe etc, but none were exactly, precisely as I would have wanted them. For me, this reader. 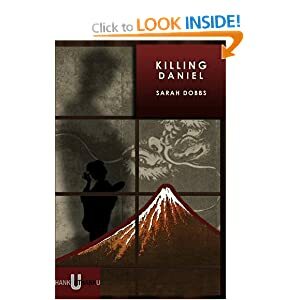 You can read a compilation of all the recent reviews about Killing Daniel here, and see what you think. Thanks to everyone who’s been kind and nice. Please leave reviews on Amazon and Goodreads if you have the time – it helps! Honest!